This is a blog post for almost none of you. And if you find it weird, well.......you should. While not totally stream of consciousness, it's kind of odd. It starts off with Rebecca sending the email group this facebook 'event'. TWO - count 'em - Burt Reynold's movies to celebrate his 93rd birthday. Or something like that. ...and only one of 'em is a good movie (The Longest Yard). I mean, if I lived in Columbus, and they were showing Gumball Rally Cannonball Run II, I'd totally be there. Totally. 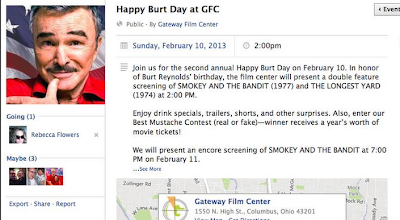 Dith says she has to tell her brother about this - the movie / birthday thing. Umm...Ok. I thought maybe it was because Jack had a crush on Mr. Deliverance, but apparently it was more than that. You'd think Lyle and Eric Menendez had a horrible upbringing, apparently they had nothing on Dith and Jack who were traumatized - traumatized, I tellz ya - by the break-up of Loni and Burt. "Scarred" was the word used. By Loni. ...and Burt. The collective. I would understand if it were over the heartbreak of Sally Field and Burt or maybe due to the cancellation of WKRP in Cincinnati. But Loni and Burt? Those crazy kids never had a future. ...and by 'those crazy kids' I clearly mean Jack and Dith. Still the second most twisted thing would be a Burt Reynold's movie double feature. That's just fucked up. It won't make a dime! never been a fan of burt's and have never seen the movies you mention. I don't think I am missing much.